There's more in store than you can imagine. Whether you’re in school, raising a family or working on your next big move, you can find a Part-Time Retail gig that works for you. It’s more than just great pay and the hottest tech. It’s your chance to have a job that works for you. 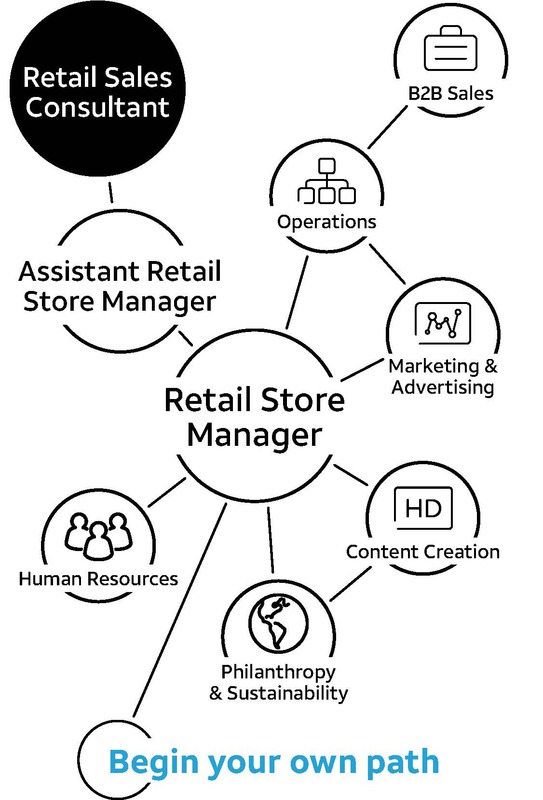 What makes a successful Part-time Retail Consultant at AT&T? Check out the traits we’re looking for and see if you have the right mix. What’s this job really like? Great things are in store! Our part-time careers allow you to optimize your earning potential by working during the store’s busiest times, including evening and weekend hours. Excellent pay and fewer hours with more opportunities to make the sale... what are you waiting for? Do you like helping people? Do you have a strong desire to connect people with technology and entertainment? You may have what it takes to join our amazing team! Our Retail Sales Consultants build solutions for our valued customers and meet/or exceed key sales objectives. They work with a full portfolio of awesome products including wireless, connected car, and wearables. They also offer integrated, seamless, and smart entertainment options including DIRECTV & DIRECTV NOW. You’ll use your knowledge and passion to deliver an effortless customer experience while pursuing challenging and rewarding goals! This role comes with a very competitive salary and commission package as well as awesome benefits. We are passionate about innovation, we love our employees and we love connecting our customers to their world. Sharing your knowledge with our growing customer base comes with many rewards. Start with the paycheck: Base plus commission. Our current part-time Retail Sales Consultants working 20-24 hours per week earn an average of $30,725 per year in total compensation. •	One of our latest devices and a service plan. Using our technology, gain first-hand expertise to share with our customers. •	Discounts on accessories and additional AT&T products and services. That means you always have access to the coolest gadgets around. •	A spring and fall fund to spend on a wide range of Team Color apparel. You’ll even receive a welcome kit of fun gear to get you started (including two shirts). Prior retail or customer-facing sales experience is a plus but not required. AT&T Sales training will be provided. You may be invited to complete an interview by recording a video, so make sure to watch your email for updates. Want to know what to expect? Here’s a breakdown of the typical application process. Check your status regularly. Timing varies, so log in to see where we are. Check your email regularly for any follow-ups. You may have to pass an assessment before moving on to the next step. If you don’t pass on your first attempt, you’ll be eligible to retake your assessments after 6 months. Your interview may be online. Make sure you have a strong connection and dress professionally. Congratulations and welcome to AT&T! Our goal is to set you up for success at AT&T. That’s why we’re providing you with the information you need to prepare for the entire application process. In particular, your assessment will ask behavioral questions to test if your sales and customer services skills are a good fit for this opportunity. When you’re getting ready, it’s a good idea to find a quiet place, get in the zone and answer as honestly as possible. And to prevent any errors from happening, make sure you are doing so on a computer and not a mobile device. As a Retail Sales Consultant, you’ll have access to training and rewards (like tuition reimbursement) — empowering you to blaze your own trail and explore other business areas. We take care of our own here (hint: that could be you). Our benefits and rewards mean we cover some of your biggest needs with some of the coolest offerings. We already think we’re a pretty great place to work. We’re just trying to rack up some bonus points. Let’s start with the big one: Your work gets rewarded with competitive compensation and benefits. It really does pay to be on our team. Wanna make your friends really jealous? You’ll get discounted access to the latest and greatest AT&T products and services – plus other awesome items, like tickets to live events. Vacation? Staycation? Heck, let’s take a road trip. On top of paid holidays, chill out with paid time off (PTO) that you can spend any way you want. You strike us as an over-achiever (don’t worry, it’s a compliment). Our training and development programs are your ticket to expert status in your job. Our people have class. Literally. We can help you out on approved education costs with our tuition assistance plan. When the day comes that you get some much needed R&R (not that you’d ever want to leave #LifeAtATT) you’ll know your future is set with the AT&T Retirement Savings Plan (ARSP). Here’s another reason to breathe easy: You and your family get access to excellent medical, dental and vision insurance options.